Last year wasn't kind to everyone, but it was a standout period for Glossier. The cool-girl brand launched an impressive lineup of products—from the Generation G lipsticks to the Super serums—leaving us wondering what could possibly come next. Less than two weeks into 2017, Glossier has already hit us with another titillating release: the Priming Moisturizer Rich ($35). This new "luxurious face cream" is a richer, more decadent take on the original Priming Moisturizer ($25), and according to the brand, this new product can be used as a night cream or under makeup. Full disclosure: When a beauty brand is embraced by the public as wholeheartedly and passionately as Glossier is, my knee-jerk reaction is to proceed with caution. 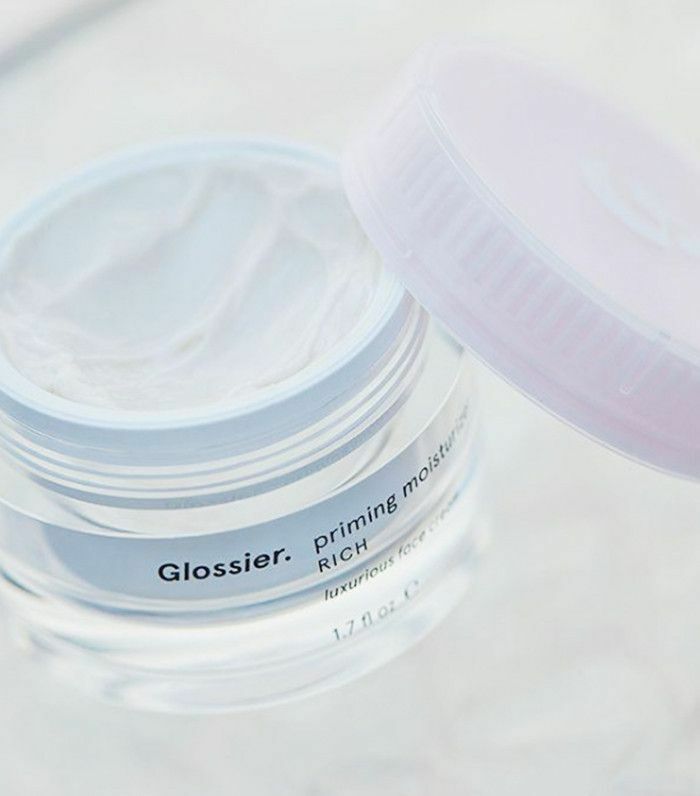 Glossier's packaging and branding are incredibly cool, no doubt, but I'm looking for the ingredient list, application, and results to deliver too. 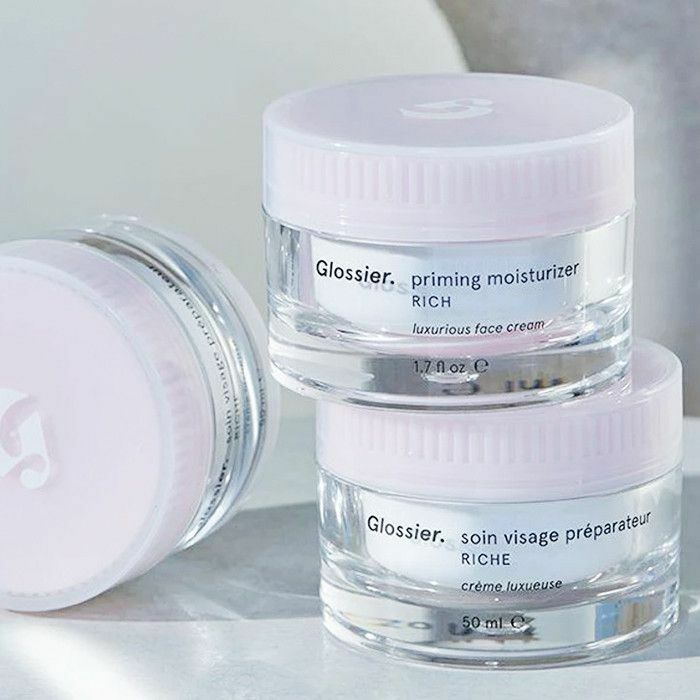 I can tell you for a fact that I already dig Glossier's original Priming Moisturizer—it's light and hydrating, and it creates a smooth canvas for makeup application. But is its self-proclaimed "dense, sumptuous" new counterpart worth another purchase? Keep scrolling to find out. Upon opening the 1.7-ounce glass jar, the cream looks incredibly thick and rich. It has a spa-like lavender scent that instantly soothes your senses. By the look and smell of things, the product definitely reads like more of a night cream. The formula is designed to deliver intense moisture, and that is certainly what it does. The product packs ceramides, fatty acids, a red algae complex, and murumuru butter, all of which serve to hydrate the skin and protect its moisture barrier. I applied a nickel-size amount of cream at night after cleanser, toner, and serum. It felt thick upon application but sunk into my skin with impressive haste—exactly what you want in a night cream. In the morning, my skin seemed softer and glowier than usual. That said, I was suspicious of how the product would work under makeup. It's super rich, has no SPF, and smells like sleepytime—this does not a day cream make. However, I was pleasantly taken aback to find that once again, the product sunk in quickly, didn't appear greasy in the least, and didn't pill under my concealer. In fact, my face makeup had been flaking off lately due to some pesky winter dryness, and this product actually helped it adhere to my skin better. Plus, because the texture is thicker than my usual daytime moisturizer, it created a welcome glow. I approached this cream with skepticism, but so far, I'm impressed. Personally, I think I'll continue using it mainly as a night cream. (After all, $35 for a rich, lavender-infused night cream is rare.) And on drier days, I can see myself reaching for it in the morning. Hats off, Glossier. It looks like 2017 is going to be another good year. Next up, don't miss seven cool-girl beauty brands to check out if you love Glossier.